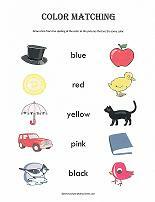 Worksheets for preschool children can be used to help teach colors. 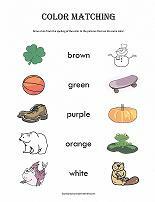 Use the preschool printables below to teach both colors and help children recognize color names. 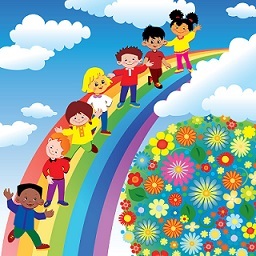 The concept of colors can be difficult for children to learn. There are a couple of ways to make teaching colors easier. Start by placing the color name after the object. As in, "the car is red", "the ball is blue", etc. Hearing the color name last helps children to realize that the color is not somehow a "first name" of the object. 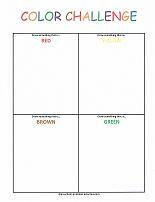 Once children have learned the basics of colors, use the worksheets for preschool children below to reinforce what has been learned. 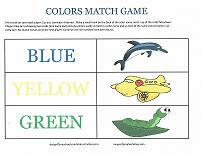 Early readers will enjoy the color matching worksheets. 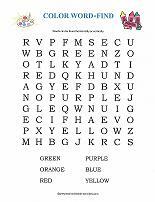 Read the color names in the center of the color worksheets and draw a line from the name to the objects of the same color. 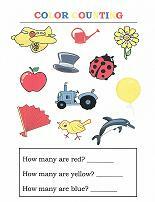 Try counting colors with these preschool printables. 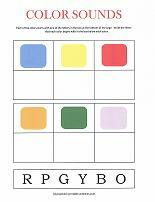 Simply count the objects of a particular color and write the answer in the box provided. One worksheet each for the primary and secondary colors. Let the kids try a color challenge. Each of the worksheets for preschool children contains four boxes. The challenge is to draw something that is a particular color. Here's a "Little Learner" booklet to create. Start by coloring the pictures of fruit. 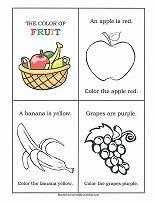 Each fruit will be colored it's actual color, helping children to identify colors with objects they are familiar with. 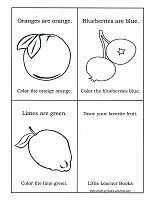 The second page includes a blank box for the kids to draw their favorite fruit. Once colored, cut on the lines to form eight "mini" pages and staple at the top to finish the booklet. Most children have fun with word-finds. Try finding all six colors. Words can only be found horizontally or vertically. No diagonal or backwards words. 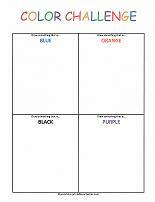 Or, try a color "sounds" worksheet. Have children say each of the color names out-loud. Each color begins with one of the letters at the bottom of the worksheet. 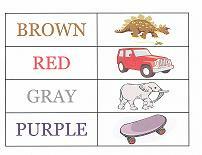 Place the correct letter in the box below each color. Anytime children are using crayons, they have the opportunity to learn about colors. 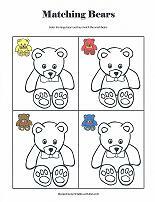 The "Matching Bears" worksheet asks children to color the large bears to match the small ones. 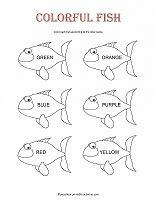 "Colorful Fish" all have color names so the children can color the fish the correct color. Matching games have been around for decades. Here's one for colors. 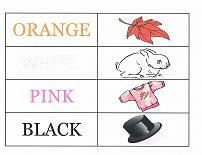 Match the color name with an object of the same color. To make it easier on younger children, once the cards have been printed (I recommend card-stock paper and laminating), place a small mark on the back side of the color names. Then children will choose one marked card and one unmarked card. Or, simply lay all the cards face up on a table and let the kids match the color names with the pictures. 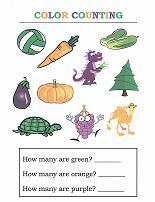 Worksheets for preschool children will help build a variety of skills and help with retention. Repetition is the key. The more children are exposed to a concept the better they understand it. Realize, also, that children will understand a color better if they realize what a color is not. To make this easier for them, show them three objects at a time. Two are the color you are teaching (ex. red apple, red toy car), and the third object is another color (ex. blue ball). Say to the child, "The apple is red, the toy car is red, is the ball red?" Do not name or focus on the color of the third object. You are simply giving children a clear visual aid of what a color is not. This makes it easier for children to understand the concept of colors. Graph Art Fun - A fun way to color-by-number. See the picture forming as you are coloring!